Almost all of us believe that there is no such thing as ghost or spirits. But will you believe it if you experience unnatural activities in person? 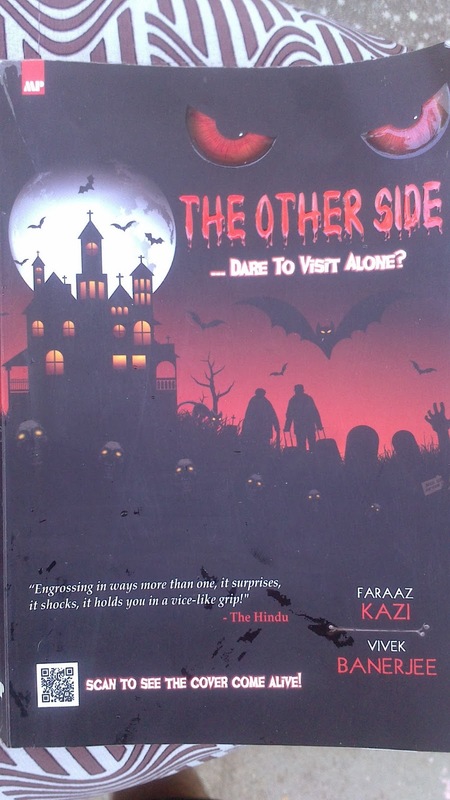 ‘The Other side’ is the recent book I finished reading. This book is a work of fiction involving 13 short stories about ghosts, paranormal activities and such things many of us believe doesn't exist. Each story is unique in its own way. Half way through the story, you will feel you've predicted the outcome, but in the end, authors manage to surprise you by giving a different climax. For example, in second story I thought the late night visitor would be ghost, in 4th, I thought the lady who asked for lift will be ghost, but the story proved to be otherwise. Irrespective of how much you believe in ghosts or super natural powers, the stories are gripping out of sheer curiosity of what would happen next. The book is slightly longer with 320 pages, but since each story is unique, you can read one or two stories at a time as per your convenience, without having to worry about forgetting the context. Every story has its own locations- Goa, Simla, Lonavla, Munnar and so on. So you get to know about different places in India as well. A mother's love, The long weekend and 'Unfulfilled desires' are the 3 stories I liked the most. Some of the stories are well complimented with black and white diagrams. And the book has a QR code too. Clicking on this redirects users to this video. Good thought by the team to complement the book with a video. Besides the 13 stories, do read the prelude and epilogue as well. They provide some vital information and background. Title: The Other side- Dare to visit Alone?